Peel the beet and cut into slim slices using a mandolin slicer. The slices must have flexibility, but they should not be broken. Put the best slices in a bowl and add the bowl lemon juice, extra virgin olive oil and salt, mix them up with hands until all the slices are soaked. Let them macerate for 30 minutes and drain them. 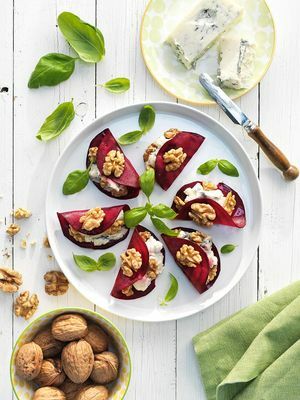 Fill in the beet slices with blue cheese and chopped California walnuts. Put approximately one California walnut in each one. Serve it accompanied by basil and extra virgin olive oil.